With a high of 36.8c (98.2f) today, nothing much exciting happened. Just tried to stay cool inside with the airconditioners going. But now at 9.15pm the temp has dropped to a comfortable 26.6c (79.8f) and I can just feel a slight breeze. 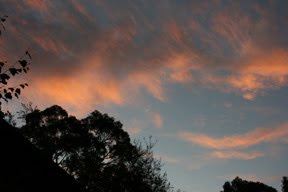 I am sitting out on my back deck with Zoe (dog) and Caspa (cat) looking at this great cloud colour and formation. This is my "Davine Time" for today and it is so nice just sitting and catching up with my blog friends. Tomorrow is supposed to reach a high of 43c (109.4f - bl...y ridiculous) - looks like another day indoors!! My dear girl, I hope you do not have humidity with those temperatures...we get in the low 100's out here in summer, but with basically no humidity...when I lived in the Deep South of course there was the humidity and it made it *so much worse* -- at least those beautiful coral-pink clouds topped off the day!! Oh my goodness Davine, that is so hot! I think that I'd rather stay put right about now where today was a beautiful 5 degrees... yup no minus which is so strange for January. I love what you have captured here, the skies are so beautiful!